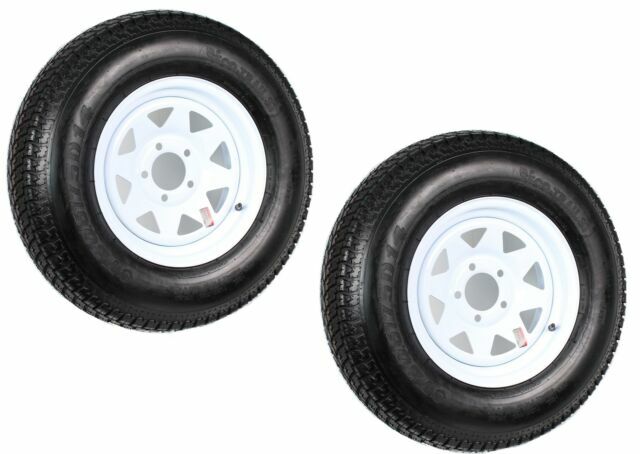 Pre-Mounted Trailer Tires & Wheels; 2-Pack Trailer Tires & Rims Bias Ply 205/75D14 Load C 5-4.5" White Spoke 14"; Tire Size: 205/75D14; Aspect Ratio: 75; Section Width: 205; Load Range: C; Tire Weight Rating: 1760 Lbs. ; Maximum Pressure: 50 PSI; Tire Composition: 6 Ply; Tread Depth: 7.8/32"; Sidewall Description: BSW; Speed Index: M; Load Index: 100/96; Internal Tire Type: Tubeless; Rim Size: 14" X 6"; Bolt Configuration: 5 Lug 4.5" Center; Offset: 0"; Center Bore: 3.19"; Rim Construction: Steel; Rim Style: Spoke; Rim Color: White; Wheel Hub Diameter: 6.50"; Lug Value Hole: 0.45"; Hub Stud Size/Nut Requirement: 1/2"-20 60 Degree Cone Nut; Torque Specifications: 90-120 Ft/Lbs. ; Warranty: Two Years; Pack Quantity - 2-Pack. Tires came brand new mounted on new rims. I have them on my boat trailer with an 18' Thompson cutlass, track and ride really well, trailer doesn't shimmy or have and Noticeable shake. Overall extremely pleased with them. And would but again if needed. good quality one thing less to have to worry about. Good bang for the buck!!!!! !